Ask any hiker that ventures into the backcountry what the hardest part of the experience is and many will say “the mental part.” Up until we logged hundreds of miles on the trail, I’m not sure if this would have made any sense. Our recent journey off the path reiterated the mental part. The fun began after we arrived at the Onion Valley Campground parking lot, fifteen miles or so from the tiny town of Independence. The drive up from the town is an experience. The road starts with a gradual climb out of the valley and the 180 degree switchbacks made it an exciting ride in our old BMW. We saw mule deer along the way. Be careful of the occasional rock in the road, especially at night. The campground isn’t much in itself. It’s pretty much a tent-only camp tucked away in the small valley where summertime temps creep into the 80’s. At over 9,100 ft. Independence Creek flows nearby. We would park in the hiker’s lot and noticed a few hikers finishing their trek. It was mid-late afternoon and some were looking for rides into Independence or Bishop. The parking lot has a double vault toilet and cool creek water through a spigot. In the summer, there is always someone coming or going here. We started up the path sans hiking poles and my wife found a nice wooden hiking stick that another kind soul left near the trail-head. 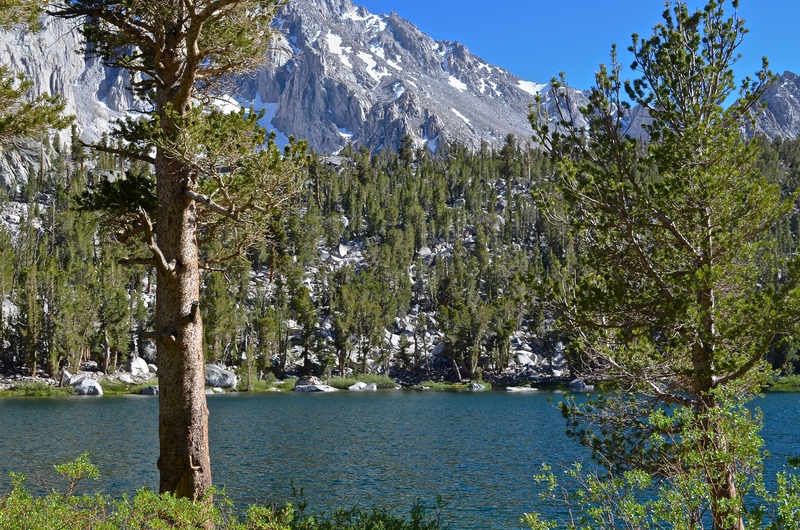 The Kearsarge Pass trail is a steady climb, averaging approximately 600-700 ft. per mile. Well maintained, it gets a lot of traffic during the summer. About half are day-hikers and those fishing. The mild winter was kind to the trail and it was in good shape. Since this was a 3 day hike, we packed extra food and enough clothing to change out. 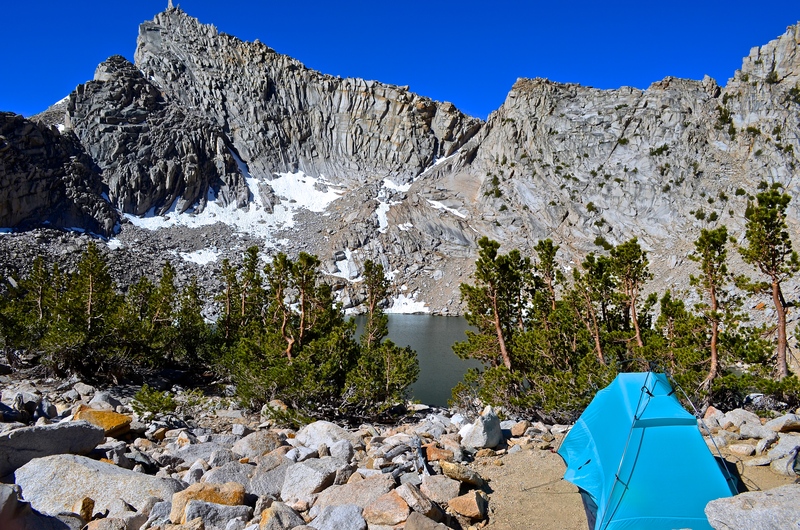 Our packs were light compared to our previous JMT hike, but I might as well have been carrying a couch on my back-that’s how it felt after a couple of miles. For me, hiking is one of those activities that demands everything you’ve got. Unless you are a thru hiker or able to do this every week, it pushes you. That’s part of the reason we do this – it is a mental and physical challenge. Do this, and you can handle anything life throws at you. My takeaway is “mind over matter”. This hike starts out with typical scrub and manzanita. Expect a warm one in the summer unless you start early. Around 1.5 miles, you’ll pass next to a nice cascade fed from the lakes above. Within another mile, we passed a couple of lakes, teeming with trout. Experienced our first mosquitoes around 10,000 ft., but not too bad. The terrain gradually changes into a sub-alpine with a mix of pine and deciduous trees. There is ample shade as you pass the 2-3 mile mark and the climb gets a bit harder with stepping-stones that test your endurance. The wind picked up and it started to feel cool. As long as we kept moving, it was ok. Stop too long and it got cold. We pushed through and around 6:30, began looking for a campsite. The trail map showed a couple of more lakes within two hundred yards of the trail. Nice, or so I thought. 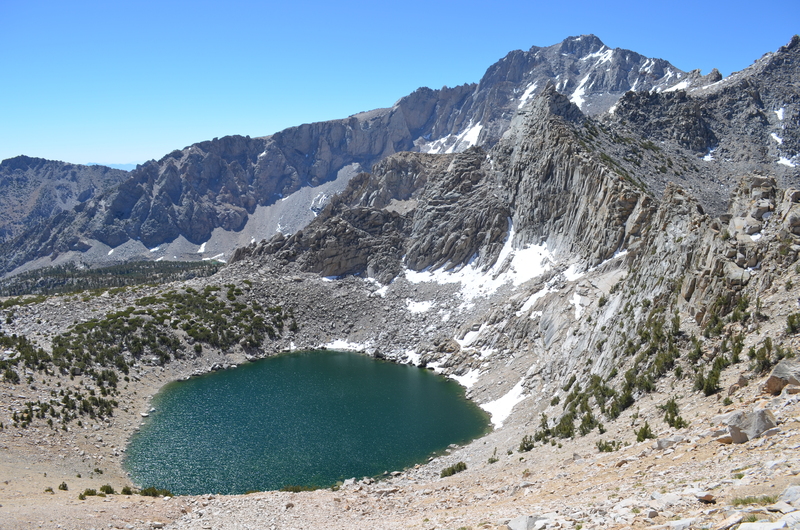 The first one – Heart Lake was a disappointing 5-600 ft. descent so we passed it up. My goal is to almost always camp near a water source. Only one more lake on the map before the “summit” so this was it. I took a GPS reading and compared it to my Tom Harrison map. I confirmed there was a lake below when I asked a passing hiker. He was young and had his earphones in so, I asked a couple of times – “Hey is there a lake down there?” He nodded yes, so we began to look for a way in. Looking down on Big Pothole Lake. 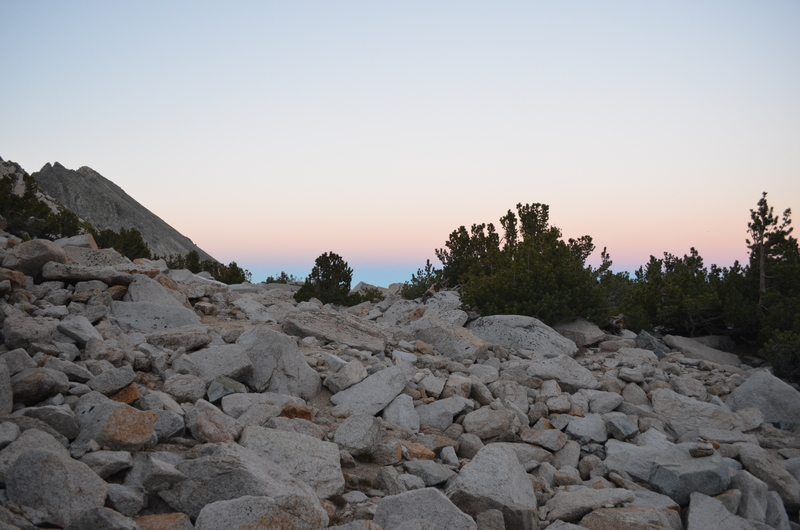 It was after 7 p.m, and getting colder so we began our way down crossing through a talus field of assorted boulders. About two hundred feet in, I spotted a primo campsite. Flat, sandy and large enough for our little Eureka tent. We settled in quickly and had dinner going within 20 minutes. 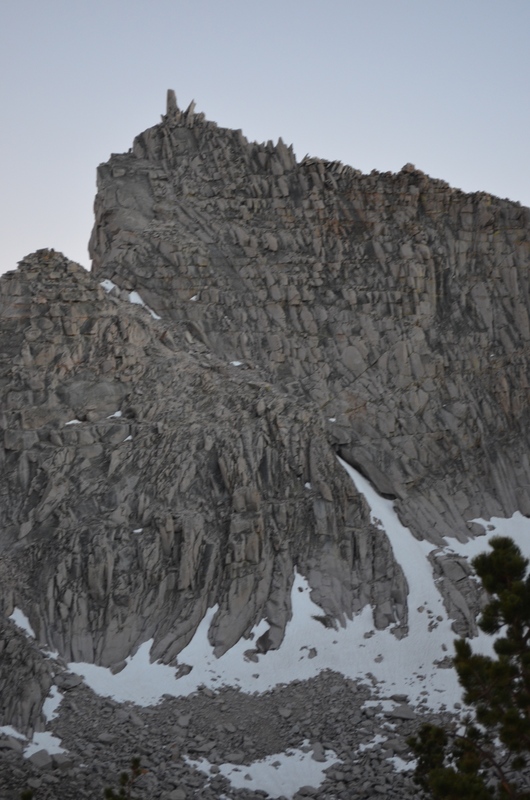 At 11,400 ft., the air chilled as the sun settled behind Kearsarge Pass. I scrambled 200-300 ft. down the slopes of Big Pothole Lake to filter some much-needed water. Six liters later, I slowly climbed back to camp. Much of this water was for our base camp. We try to “tank-up” before hitting the trail because water is so heavy. There was a strange phenomenon up here. Moths, thousands of them inhabited the little pines. At dusk, there were bats. They would swoop in, emitting their sonar like squeaks. It was quite the feast for them. Never knew there were bats this high. It was a chilly night, windy with temps in the 40’s. Not bad, but the wind chill made it seem cooler. This close to the pass, a stiff breeze was inevitable. We snuggled into our sleeping bags, each of us with persistent headaches. The thought of Acute Mountain Sickness (AMS) was at the front of my mind. We were camping at the highest we’ve camped yet. A couple of motrin helped to knock the edge off. If the headaches persisted or other symptoms like nausea and dizziness occurred, we would have to descend. Neither of us slept well. Sunset. Our talus backyard in the foreground of the eastern sky. Next: Pillsbury Does a Handstand at Kearsarge Pass.